I am slowly but surely drafting up the patterns that I am obsessively knitting. Someone needs to invent something that writes down your steps and charts your stitch patterns as you knit them. Can someone get on that asap please? Because I probably have 4 more designs in need of written patterns. And by “written pattern” I mean non-chicken-scrawled, speshul snowflake angel shorthand patterns. 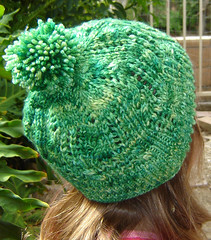 However, I have completed one pattern, and it’s ready for it’s debut! This is bound to be your child’s favorite hat! The clever use of cables and lace has given a traditional knitted winter hat a fun and new slant. Knit in super soft, super warm 100% superwash merino, it’ll not only keep your little one comfy and warm, but will wash up wonderfully time after time. If some of you are saying “hey, that looks kinda familiar,” you’d be right. I took a page from Hollywood’s book and decided to reinvent a pattern I had previously written and submitted to a design contest. I re-engineered it to use my Dirty Blonde line of yarn instead of a discontinued yarn. Also, I took the slant of the cables and lace in a different, more pleasing direction. And now it fits a wee head much better than the original did. 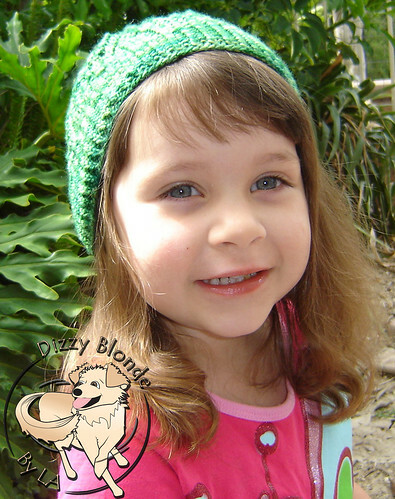 The pattern is selling at the introductory price of just $1.49, and you can find it on Ravelry, at Dizzy Blonde Studios, and eventually here in the sidebar. BTW, the adorable model is my darling 3-yo step granddaughter, Little Miss M. Yes. She’s already 3. She can’t POSSIBLY be 3. You clearly bought that child because Marina is still a baby. There is absolutely no question that the model wins the cute contest. She is adorable! 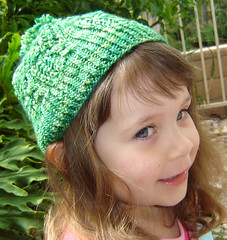 I love the hat – must make it for my own soon to be 3 y/o granddaughter. Off to buy the pattern now.